This guide will be covering the best fruit fly repellents money can buy in 2019! What causes fruit flies in the first place? When you have fruit flies everywhere, it's easy to feel overwhelmed. After all, these little guys just fly right into your home--seemingly out of nowhere--and invade your kitchen. Probably most maddening of all is that despite the fact that their flight consists of a humming, menacing hover, you can't seem to catch them in your hands! It's not like you're simply not going to eat fruit and vegetables in the warm summer months. Luckily, you don't have to take measures this drastic to reduce your fruit fly infestation. Check out our guide on what to do when they're everywhere, and which products are worth your money to keep them away. Homemade Fruit Fly Spray: Yes or No? Short on time? Take a look below for the top 4 in our list for 2019. Otherwise, check out our buying guide. It can drive you crazy to have a pest-free home one day, and have a kitchen buzzing with fruit flies the next. Where do they come from? Why do they just suddenly appear? In order to really understand why they just show up seemingly overnight, it's important to take a look at the life cycle of a fruit fly. All in all, the entire lifespan of a fruit fly is around 40 days. A female will lay eggs in a piece of fruit (or other sweet, organic material)--a few hundred in a matter of a few days. The eggs hatch into larvae, which are essentially underdeveloped, white blobs. The larvae feed on the fruit where they emerged from their eggs in order to store energy. After about four days, the larvae find a dark place to go into the pupae stage, which is the final stage of development for the fruit fly. The larvae will develop wings and six legs during pupation, which last around six days. The adult fruit flies will emerge and immediately begin flying back to the sweet or decaying food, repeating the life cycle. How Long Do Fruit Flies Live Without Food? Here's the thing: fruit flies need to feed constantly in order to survive. They take the juice from decaying or overripe organic matter and convert it to energy. If there's no food source (for example: you place your fruits and vegetables in the fridge rather than out in the open), it's reasonable to assume that your existing fruit flies will die off fairly quickly. However, because of the rapid rate of reproduction, there's probably a constant stream of new eggs hatching, new larvae pupating, and new adult fruit flies emerging at all times. The fruit flies themselves are so small; it's impossible to see the eggs and larvae in their development stages in your home. It's a common fear that a fruit fly can deliver a mean bite when a human or pet gets too close. This is actually untrue; fruit flies have no teeth! So, no biting will occur when you've got fruit flies. But here's the catch: these pests burrow in the flesh of overripe food. They fly around from one decaying surface to the next, feeding off of the organic matter as it breaks down. This means that they're susceptible to carrying disease and bacteria, and of course, tracking it all over your kitchen. To consider a tiny, flying insect either a gnat or a fruit fly (almost interchangeably) is incredibly common. Many people believe the two to be synonymous, but they're actually two very different insects entirely! Here's how you can tell the difference. Fruit flies are attracted to the sweetness of fruits or decaying vegetables. They derive their energy from these sources of organic matter, and they can usually be seen hovering around trash cans or fruit bowls. These insects have the body type of a common housefly, albeit a lot smaller. Their eyes are bright red and their bodies range from amber-colored to tan, depending on their stage of adulthood. However, it can be very difficult (or nearly impossible) to identify these features by the naked eye, as these insects are so small. Gnats, on the other hand, prefer damp environments. It's not uncommon to see a hoard of gnats hovering over a sink drain, near potted plants with damp soil, or by stagnant bodies of water. The gnat has a body shaped more like a smaller version of a mosquito than a fly. The legs of the gnat are a tan shade of brown (like the entire body of a fruit fly), but the torsos are black or dark brown. The biggest difference? Some gnats (but not all), bite humans and animals! So, why do people confuse these two insects so often? Well, they're both incredibly small, for starters. Gnats are a bit smaller than fruit flies, but that's really only apparent when you're comparing the two under a microscope. When they're buzzing around your house uninvited, it's easy to assume that they're actually the same species. Take a look at this article for more information on fruit flies vs gnats! In our way of life, it's natural to want to spring for a homemade version of anything sold in stores. In the case of getting rid of fruit flies, is it a good idea? With all the harsh chemicals out there in commercial products, many people will always want to try a home remedy to solve the problem of fruit flies before they take over the kitchen. As far as fruit flies go, a DIY spray is more of a preventative measure than an exterminator. Because these guys take flight, it's difficult to target them with a spray, even though they fly slowly. You'll end up streaking your kitchen with the spray, instead of the fruit flies you're trying to eliminate. However, that shouldn't turn you off to the idea of a fruit fly spray. When used properly, a spray can act as a repellent for future fruit flies who want to take up residence in your home. Peppermint oil is the gold standard ingredient when it comes to repelling pests and insects. Well, the answer is joyfully simple: it's irritating. The scent of peppermint is incredibly unpleasant to almost all pests, so when they smell it, they want to simply go away. So, as long as you've got concentrated peppermint oil, you'll be good to go. Simply shake a few droplets with hot water and store in a small spray bottle. Apply the mixture in your kitchen at the beginning of summer in order to create an unpleasant environment for fruit flies at the very beginning of their peak season. If you're looking at a fruit fly infestation, you'll want to use trusted methods to knock them out quickly and keep them from returning to your home. Take a look below at some of the most tried-and-true ways to banish fruit flies from your home, and prevent them from coming back. If you really want an in-depth review check out this article on everything you need to know to get rid of fruit flies! These types of repellents are quickly becoming the most popular on the market in terms of pest repellents. They're small, wall-mounted devices which are usually sold in multi-packs for protection throughout the home (as opposed to in just one room). An added benefit to this type of protection: these small devices aren't just used for fruit flies! Many household pests are deterred from entering the home when these devices are in use. How they work: the device produces a wave of energy that interferes with the pests' central nervous system. Your home becomes an uncomfortable environment for the pests, so they just clear out. Simple, right? These are less of a repellent and more of a proactive measure to rid your home of fruit flies, but this method is effective (and recommended) nonetheless. The benefits here are that these glue strips are usually pretty cheap and can be swapped out easily in no time once they've run their course. How they work: These strips can be either applied to walls, along doorjambs, or stashed in a corner. Fruit flies will fly into them and get stuck; sort of like a manmade spiderweb. Once the strip is full of dead fruit flies, dispose of it and set a new trap. Although not mentioned, fruit fly traps are also a great way to fend off an invasion of these pesky insects. Check out our guide here. Normally, these sprays will have some sort of agent to bother the senses of pests. This can be a simple repellent like peppermint oil, or it can take the place of something more potent, like an insecticide. How they work: You can simply spray these solutions as directed within your home or outside in your yard and let the spray do the rest. It can be difficult to spray a flying insect, but some sprays are targeted toward these pests with wings. Now that we've gone over some of the detail about fruit fly removal methods, let's break down each of our product recommendations in a little more detail. This is your average electronic pest repellant, as described in the section above. By creating an ultrasonic wave through your home, pests will no longer find it a comfortable place to be, and they'll leave. We really like the MaxMoxie due to its track record of success and wide effective range. This spray is versatile in that it can kill existing fruit flies that may be hovering around your home, but it also keeps that away after that. Although not a traditional "repellent" we did want to include it as an option if the circumstances were appropriate. Pretty much all bugs are attracted to light, and this device takes advantage of that. 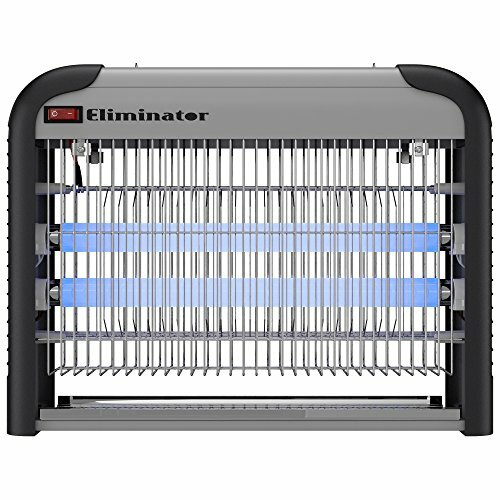 Shaped like a sort of cage, the Eliminator Electronic Bug Zapper gives off a blue glow that lures in fruit flies, and exposed electrical coils that literally zap the fruit flies to death. This product is marketed mostly for commercial use, but is designed for use in homes as well. 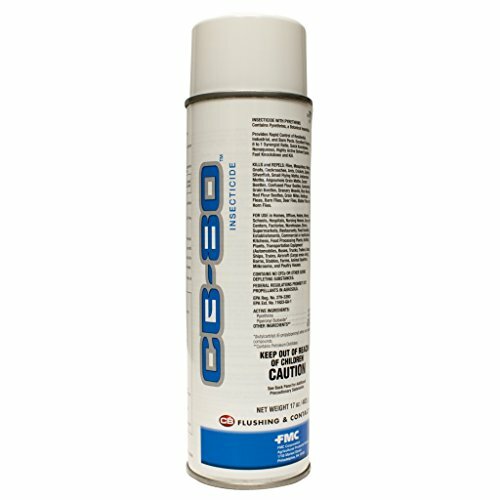 The spray is compressed in an aerosol can and shot via an applicator to reach smell spaces and tiny crevices in homes or commercial buildings. When you've got a fruit fly problem, you're going to want a fruit fly solution, and fast. 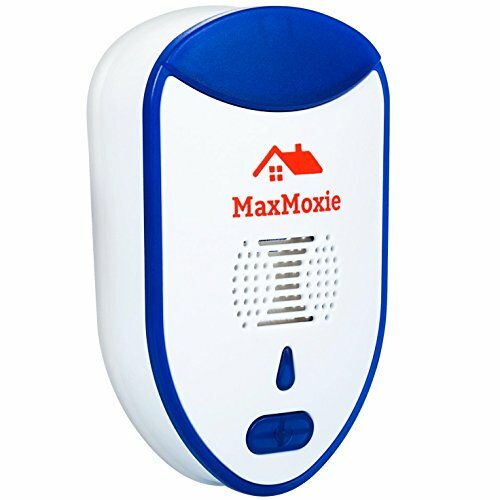 MaxMoxie Pest Repeller. Not only does it protect a wide area of your home with just one device, but it utilizes zero chemicals, scents, or sticky substances to get the job done. Its affordability, simple setup, and ease of use makes it our top recommendation for the best way to repel fruit flies in your home, office, or business. Curious about other fruit fly related articles? Check out our other detailed guides to help you deal with your pest problems.